As a teenager I watched the story of the Ghost and the Darkness and the mysticism of Tsavo made it a dream destination for me. I wanted my eye to witness the land of the famous man-eating lions responsible for over 130 human lives and I was really looking forward to my visit to one of East Africa’s oldest, largest and most prominent wildlife strongholds. The drive from Amboseli to Tsavo made me witness a dramatic change in the habitat for as an African forest Tsavo was remarkably different from popular African wildlife havens like Amboselli and Masai Mara. The see-through Savannah grasslands of Mara had disappeared and so did the open horizons of Amboselli. The narrow tracks covered with thickets of palm, acacia woodlands and the riverine vegetation reduced the visibility and this was the making of a tough jungle drive in the coming days. Millions of years back lava flowed throughout this land owing to volcanic eruptions thus giving Tsavo some unique hill formations and the characteristic red and black soil, which makes this a refreshing terrain for nature photography. The fertile soil along with rivers like Galana necklacing the forest makes Tsavo a unique ecosystem in itself. Having observed and shot massive herds of African elephants in Amboselli, my craving for elephants was satiated when I entered Tsavo and I was hoping to track down the big cats in this tough African terrain. During my first jungle drive I noticed some fresh lion tracks and went on their trail and as we were trying to read the red books of Tsavo soils, out walked a group of African Red Elephants that left me spellbound in terms of their size, color and majestic persona. 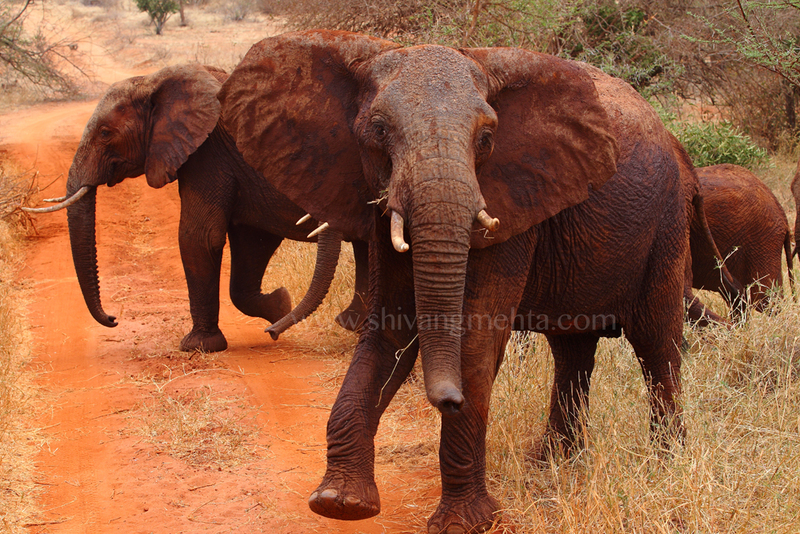 Red Elephants were now the subjects of my photography for the next few days in Tsavo. 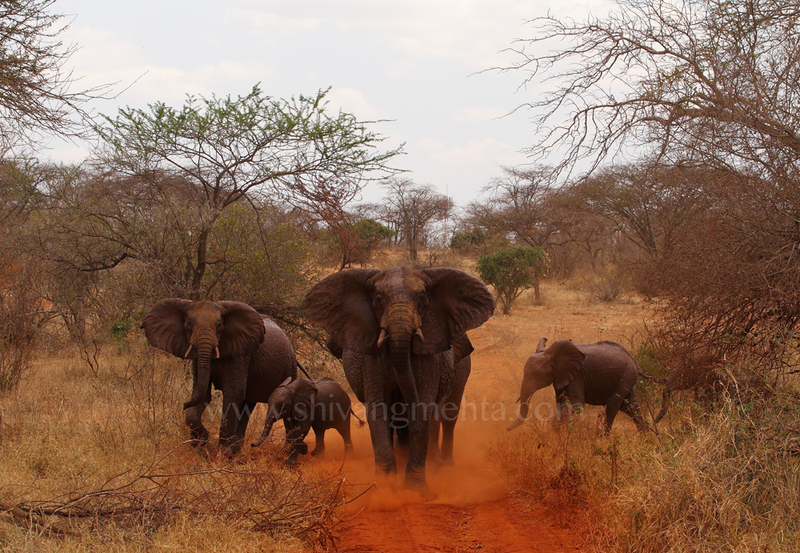 With more than 12000 African elephants, Tsavo holds more than one thirds of Kenya’s elephant population. The red color is owing to sand bathing with the red soil. 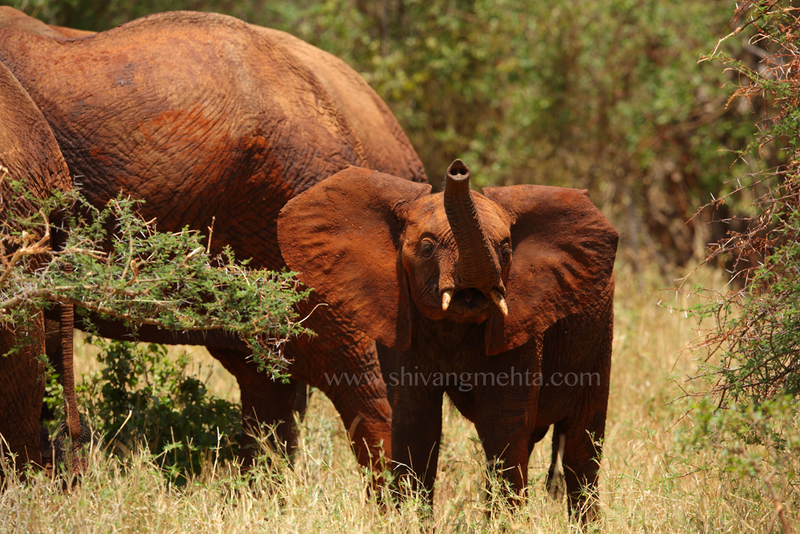 These elephants have been fighting battles against marauding band of poachers who are still active in this park. This makes the behavior of Tsavo elephants very shy and at times aggressive which is remarkably different from their Amboseli and Mara cousins. Having observed and talked to local naturalists and wildlife experts around the Tsavo belt, I felt that the general perception of Tsavo has been a tourist destination meant for relaxation rather than game viewing. A lot of tourists rely on easy availability on game in popular destinations like Masai Mara and hardly few vehicles are out on game drives because of which the information network pertaining to wildlife sightings is very low. Despite of the tremendous potential that Tsavo holds for wildlife tourism, the park is yet to be promoted in order to pull the niche wildlife travellers who can give this raw and virgin forest land the necessary exposure at a global level.